How many browser tabs do you currently have open on your computer to monitor news from your journalism beat? And how many columns do you have set up in Tweetdeck or another Twitter client to keep track of news sources? NewsWhip Spike plans to reduce that number by positioning itself as a solution for journalists to monitor and filter news shared across social networks. And while NewsWhip Spike continues to refine the platform, it is offering news outlets and journalists the chance to sign-up for free. It plans to start charging for the tool later this year. Journalism.co.uk spoke to Paul Quigley, co-founder and chief executive of Ireland-based NewsWhip, which launched a year ago as "a site that shows which stories are getting the most sharing and Twitter attention right now". NewsWhip, which tracks about 65,000 news stories every day, looks at social data from the past couple of hours and can tell users what the biggest political story in the UK currently is, for example, or the biggest health story is in the US, based on what people are sharing and talking about on Facebook and on Twitter. NewsWhip Spike aims to sort the social media chaos. "What we've got out there is a billion people using Facebook and Twitter, and they are all like little editors, they are sharing content with their friends," Quigley said. "And when you harness all of that you get a lot of little signals pointing towards the important things." After using NewsWhip, journalists then inspired the creation of what will be the paid-for tool, NewsWhip Spike. "What we realised early on after we launched it was a lot of our users were journalists and people who worked in media, and they wanted more detailed information, and they wanted earlier information," Quigley said. "They wanted to know what stories were just starting to trend, they wanted to know what stories had trended over a longer period of time, they wanted to be able to check-in on particular publications to see what is trending at the Guardian or what is trending on CNN, so there's a lot of add-ons and we realised there could be a very cool product." The team has been building NewsWhip Spike and offering a free trial to newsrooms and journalists to test out the features. 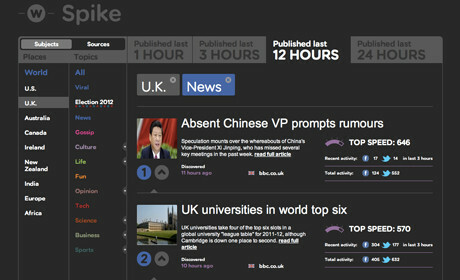 Newsrooms using NewsWhip Spike and providing feedback include journalists at CNN, Time, USA Today, the BBC, plus bloggers and a range of journalists at other outlets. NewsWhip Spike aims to give journalists an overview of everything that is trending within topic areas, Quigley said, offering an example. "If you are doing a story on a given politician as part of coverage of the presidential election in the US, or on a health issue that's 'hot' at the moment, it can be very helpful to see what people are talking about right now, to make sure you don't miss anything that can be incorporated into the story. "If you are going to write a story about [Mitt] Romney, you can check-in on NewsWhip Spike to see what's trending around him at the moment, in case there have been any recent revelations." The tool can also help journalists discover stories that are trending in other parts of the world. For example, a journalist in the UK could look for stories that are getting shared in New Zealand or Australia. NewsWhip Spike can also inspire news stories and features. Quigley gave an example. "If you want to find interesting topics to write about within an area like health or science, you can check-in to see which stories are big today or have been big in the last hour and see if you want to move those stories on." The platform also tracks viral content, such as on Reddit and YouTube, "which is where the crazier end of the news spectrum can start from". Users can go to the viral section within NewsWhip Spike and can see the stories spiralling out from Reddit and the videos gaining traction. NewsWhip Spike works by tracking the "velocity" at which a news story spreads on social and by measuring its "half-life". "The data we are tracking is social data, but there's a little more to it than that," Quigley explained. "If you just track how many shares and tweets and likes a story has, you are going to end up with old stories on top because they are the ones that have had the most time to get shares and tweets. "So what NewsWhip does is it tracks the speed at which all the different stories are spreading right now. And how it does that is we check at 2pm how many tweets, likes, share and comments a story has, and then we go back again at 3pm. We are not interested in the total, we are interested in the difference between 2pm and 3pm. NewsWhip is in a "continuous build", adding new sections "to keep finding ways we can help journalists", he added. It is adding other languages over the next few weeks, namely Spanish, French and Portuguese. "It's going to be very useful to see what's trending internationally," Quigley said. "We've got an Africa section so someone whose beat is Africa can check-in and in seconds can see which news stories are spreading fastest in Africa. They can check the past 12 hours and what's got the buzz." The team is also tailoring the product to help journalists across the world. "We are really trying to build it with a very global focus and we are going to be adding a lot more granularity. We've got a lot of users in the US who want us to break the US into neighbourhoods; and they are right because the US is too big a market to just have what's trending in the whole country." Quigley said that they are currently working on creating 20 different sub-sections to include the main metropolitan areas in the US. "And then if you've got a beat that incorporates Chicago, you can very quickly check what the big news is today." And by bringing all the news sources into one platform, Quigley believes NewsWhip Spike will simplify the news monitoring process. "I think we are saving journalists from having to have 20 tabs open and 20 different Twitter streams so that they don't miss something."